Decorative square or round pegs can be added to the corner of doors and drawer fronts (including slab drawer fronts). 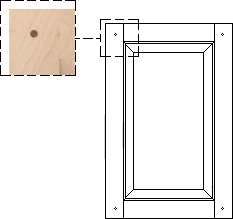 The pegs are decoration only and do not add to the structural strength of the door. The pegs are sanded flush to the frame. Square pegs measure 3/8” x 3/8”. Pegs are the end grain of a matching or contrasting wood species. A single peg is centered on both stile and rail. The double peg in a corner is centered according to stile width only. Round pegs measure 5/16”in diameter. 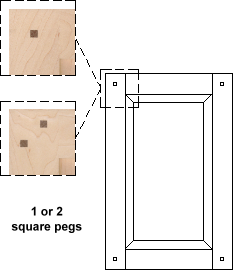 Pegs are face grain of a matching or contrasting wood species with the grain pattern perpendicular to the stile. A single peg is centered on both stile and rail.